My wife and bought an Android tablet to replace the small TV in the kitchen that was taking up so much counter space. Of course the space saving part depended on mounting the tablet under the cabinet. While there are several good tablet mounts available for $20 to $40 on the market, I decided that I wanted to try to build my own. So after researching all the different mount types, I thought that the the most effective design would be to use a ball mount, that would give the tablet freedom to move in three different axes (up/down, left/right, and rotate) using the same joint. Being an engineer I just thought there was something elegant about that solution. The first part was finding a wooden ball locally. I knew I could buy them at Rockler or online, but I didn’t want to travel that far or wait. In the end I did end going to Rockler to buy some 2″ wooden balls. At first I thought that using a larger ball would be make a smoother joint, but the smaller balls were priced much more competitively, especially for a project that I didn’t know if I would be able to pull off. 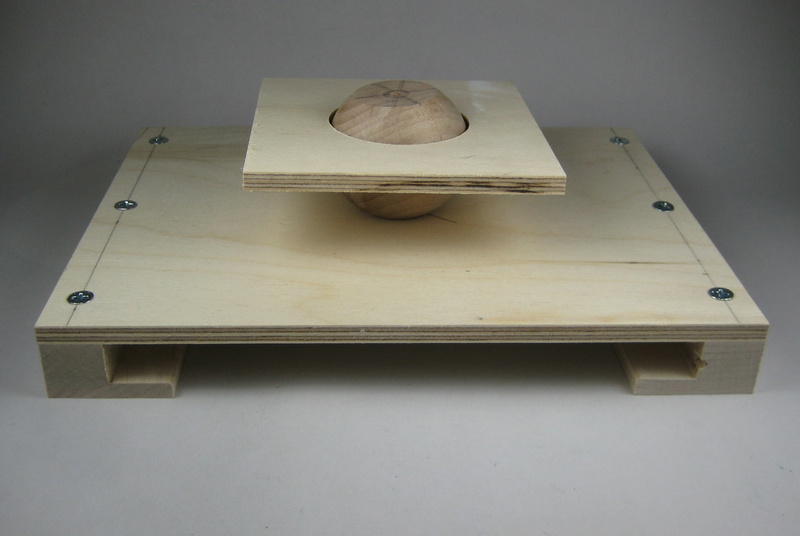 Then I needed to test my concept — would a ball captured between two pieces work as a ball joint? It turned out that the hardest part was finding the right size bit to make it work — one that I didn’t have. 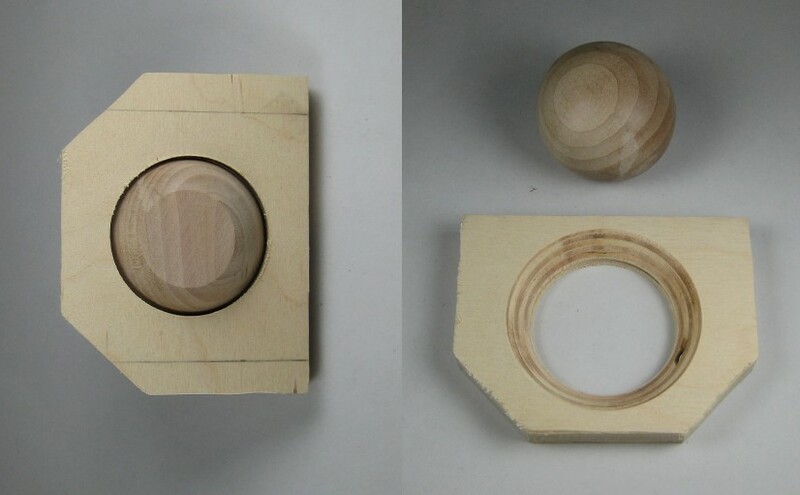 I needed one of the piece of wood to have a hole that was slightly smaller than the diameter of the ball. I did have a circle cutter that allowed me to drill the right size hole, but I hate using it because it is finicky to set up. I also discovered that a hole just smaller than the diameter of the ball covered much of the back end of the ball which would limit the travel of the joint. So I cut a chamfer around the edge of the piece. This moved the retaining piece over the front half of the ball and opened up the back end. To attach the ball to the post, I used my oscillating belt sander to flatten a 1-1/2″ face of the ball. 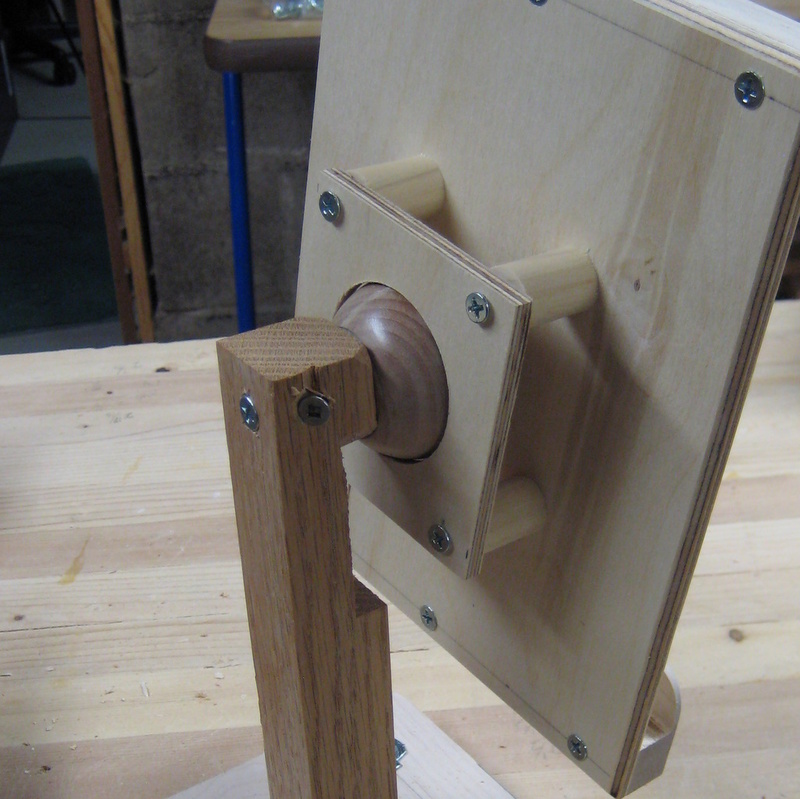 I wound up using 1/4″ Baltic birch for the mounting bracket and the retaining piece. This thickness dictated the size of hole I could drill in the mount for the end of the ball to pivot. 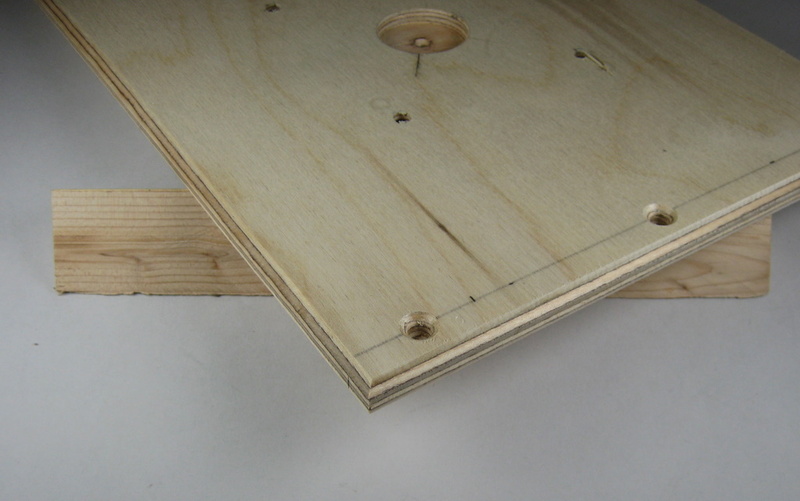 I think I used a 1″ Forstner to drill a stopped hole in the back of the mounting bracket. To connect the retaining piece to the mounting bracket I used #8 tapered head screws and some short pieces of 5/8″ dowel (see the first picture.) 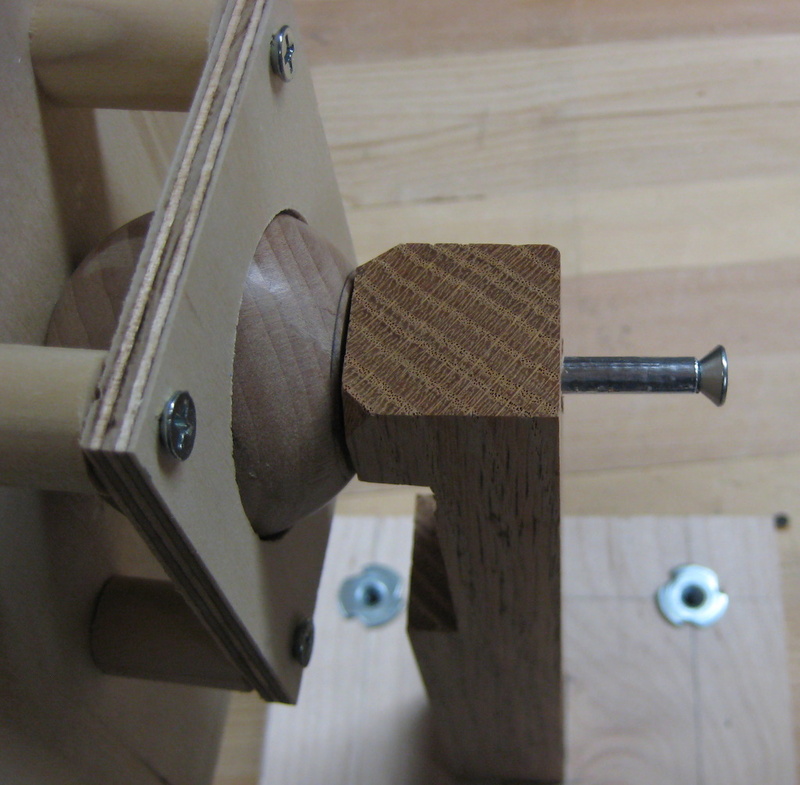 I sized the dowels so that they were about 1/8″ short, that way when I tightened all the screws, it would hopefully apply enough friction to keep the joint fixed in the position I left it. While the joint worked well the first time, it still had a few problems. First the travel of the joint was more limited than I wanted; second using a single screw to mount the ball to the post wasn’t enough to keep the ball from spinning. I attacked the problem from several angles. First I notched out the post so the retaining piece had more travel. 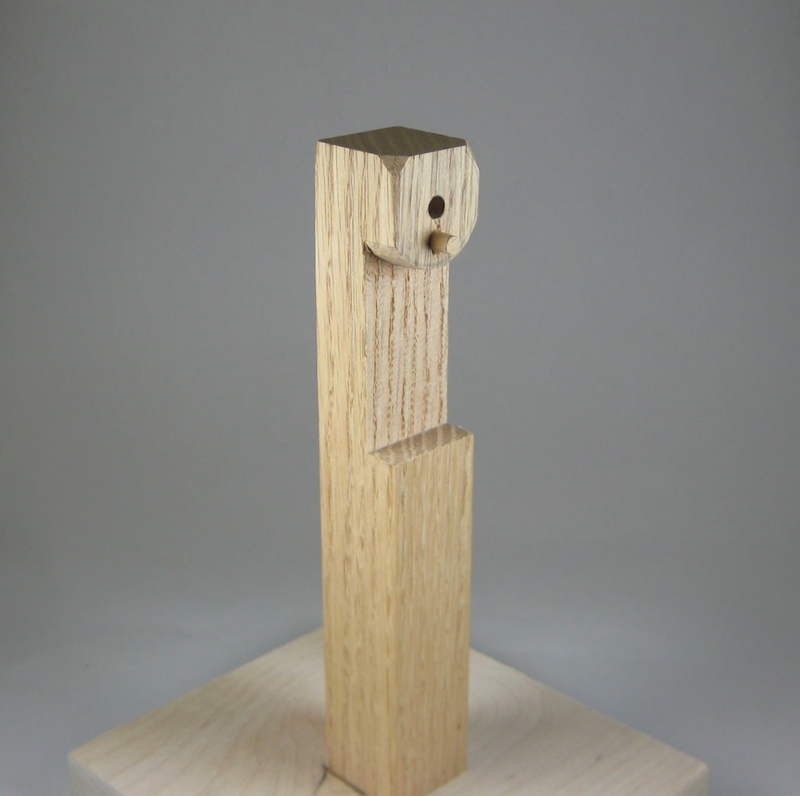 I also traces the outline of the ball on the post and whittled away the edges with a chisel. 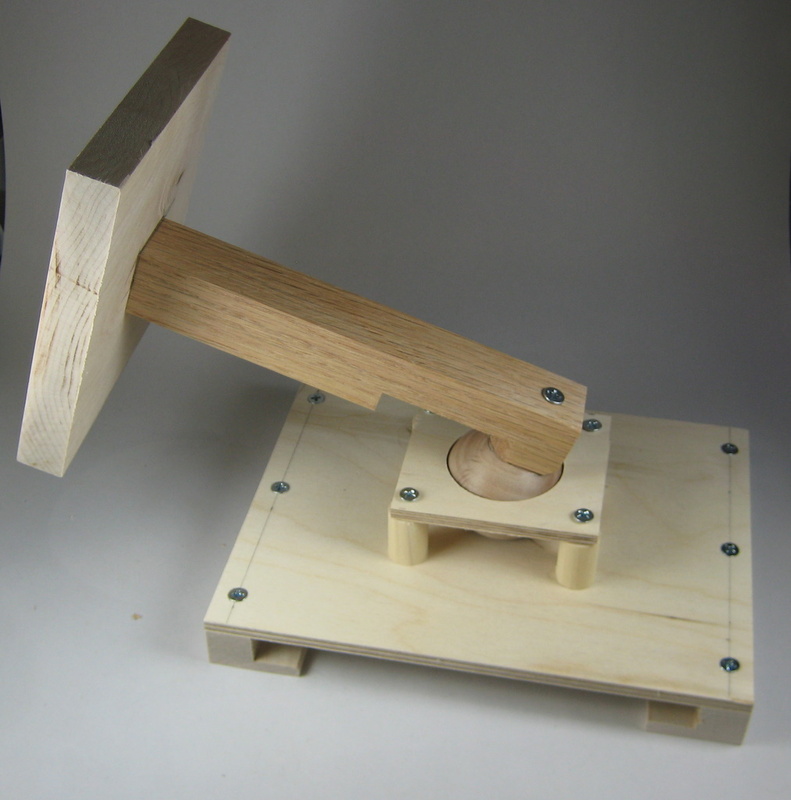 To stop the ball from spinning, I drilled a second stopped hole in both the ball and the post and inserted a wooden dowel. The peg stopped the ball from spinning, but it actually made the problem worse. As I turned the tablet bracket, the peg would compress and twist in the hole, making it really hard to position the tablet. I would rotate the tablet 90 degrees and it would bounce back a few degrees. So I took the joint apart and noticed that the ball mounting screw was slopping in the hole. To fix this I wrapped dome metal foil tape around the screw to shim it in the hole. This still didn’t make much difference. I finally ended up drilling a second hole at an angle to hold the ball steady. I doesn’t look pretty, but at least it’s hidden in the back. You’re probably wondering why I didn’t just glue the ball in place — at least this thought kept running through my mind. I wanted to be able to remove the retaining piece, in case I needed to fix or modify it further. The final thing I did to increase the travel was bevel the back of the tablet bracket. Not only did this increase the bracket travel, but it looks better too. You come up with the most interesting things to build. Sometimes it can be a bit of a curse for me. I have a hard time getting excited about going to the shop unless I have a problem to figure out. While I’m figuring it out, just try and keep me out, but once I figure out the problem, I tend to lose interest. For example, it took me three months to complete some more toy ladders for my nieces and nephews. The only way I finished them was my wife telling me that if I didn’t get them done by the time she shipped off the rest of the gifts, I was on my own.